Chasing the Rain - Ghumakkar - Inspiring travel experiences. Vishal and I rarely disagree on anything. 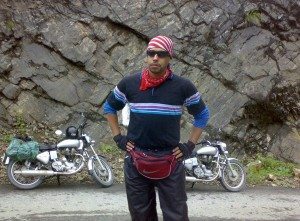 So, when Vishal proposed a bike trip, the excitement got to me instantly. The last trip we made was quite a while back and the longing for the next one was getting stronger by the day. The Independence Day falling on a Friday gave us a long weekend and we made it longer by taking the Thursday off as well. The initial plan was to go up to Joshimath and back, but that had to change. The Garhwal hills on that side are landslide prone and getting stuck on that route would have left us with no option but to come back. We zeroed in on Nainital rather. The plan was to reach nainital on the first day and keep our options open for the next two days. As usual, convincing the families was the first hurdle. But not much of an opposition came up. It’s safe to assume that our wives have, by now, come to know our souls pretty well and are happy to let us follow our hearts from time to time. That’s really pleasing I must say. Our parents, on the other hand, are typical with their concerns, but convincing them is never too difficult. On Sunday, the 10th of August, we got our bullets serviced. My bike needed new rear brake shoes and Vishal’s needed a new decompressor body and new front brake cable. With the bikes ready and all the required stuff in place, the next three days were difficult to pass. The two of us kept on planning different things about the trip over the phone. Concentrating on the regular office work was just not possible. The moment finally arrived. It was 7.00 PM on Wednesday and we were back from our offices. Time to pack our bags. The plan was to set off by 4-30 AM to avoid the traffic on the Delhi-Moradabad highway. But we hardly got any sleep that night. Vishal couldn’t sleep due to sheer excitement and I due to load shedding and mosquito bites. We woke up later than planned as a result and set off at 5.00 AM, late by half an hour. We met up at Badarpur Border. A quick hug and we were off. In order to cover the lost time we rode rather fast on the free highway and by the time we stopped for breakfast at Gajraula, we were ahead of time. The dhaba was pretty crowded that early in the morning. Many people were heading for nainital with their families. Our bulls drew instant attention. A couple of jolly looking guys actually came up to us enquired about the bikes and our destination. We simply love that ‘wish I could do that’ look in people’s eyes. That makes us feel really special. A heavy breakfast comprising of hot tandoori paranthas with butter, omlets, and tea was deemed enough to carry us past Moradabad. The weather till then was pleasant with light clouds and no sun. We soon reached places where it rained just before we arrived and the chase was on. It was a case of two bravehearts on two shining silver bullets chasing the rain. We were prepared with raincoats for ourselves and plastic covers for our luggage. The rain kept moving ahead of us but we soon caught up with it. In Moradabad we had to put the raincoats on. There we decided to avoid the popular route via Rampur-Rudrapur-Haldwani and took the less frequented Kashipur-Bazpur-Tanda-Kaladhungi route. A smart decision it was as the roads via Rampur was a real pain as we came to know later. The route we took was lovely with smooth tarmac and pleasant green surroundings. We reached Kaladhungi in no time with just a couple of stops to click some photographs. By then it had started raining heavily and we were soaked from head to toe despite the raincoats. From kaladhungi it’s a 35 km climb up to nainital and the road condition is pretty good barring a few stretches where road supporters were being constructed. Initially, my bike struggled for pickup on the steep climbs but soon I got the gear settings right and that nullified the problem. With clouds hanging so low and the refreshing greenery, it was some view on either side of the roads. But we really had to concentrate on the road, as there were quite a few S-curves and hairpin bends to negotiate. The rain got heavier still as we kept on climbing. It was getting pretty cold as well and we had to stop 16 kms from Nainital to dry ourselves. We found a nice and cozy tea stall where we put on dry clothes and had two hot cups of tea each. After half an hour or so, we resumed our ride. The rain continued to be heavy and it was a matter of time before we got soaked again. But there was no point stopping again. So, continued our climb and reached nainital by 2 PM. I had been to nainital once before but that was by bus through Haldwani. The kaladhungi route actually took us higher up on the mountain and from there it was a descent down to the nainital town. The whole town looked great in the rain. But we were in no mood to enjoy the beauty at that time. We were wet and cold and pretty miserable. We were in a hurry to find a hotel and get warm. But to our dismay we found nainital crowded with holidayers from Delhi and nearby places. It took us a while to find an economic room in a small hotel, but that too came at a cost. The hotel was at the top of a very steep hill and taking the heavily loaded bikes up there looked a tough ask even by bullet’s high standards. But we managed to take the bikes to the hotel’s yard with a couple of minor slips at the narrow hotel gate. With the bikes parked and unloaded and we in the cozy comfort of a hotel room, the spirits were soon restored. We quickly put on dry clothes and did a quick wash up and slipped under the blankets. We called up our families and gave them an account of the day. Well, there is another smart thing that we did before we set off from delhi. We carried our required supply off Bacardi along. Vishal was quick to order Limca and some pakoras and it was gradually getting too good to be true. The view from the hotel balcony was fantabulous. A good view of the lake with colorful boats lazily floating around in light rain, it was stuff dreams were made of. I clicked some photographs by the time our order arrived. The bacardi and pakoras made us warm in minutes as we watched a movie on the tv. Some very tasty aloo paranthas followed, we soon had our stomachs full. It was time for some sleep. We dozed off with the tv on. In the evening, we set out for a walk by the lakeside. 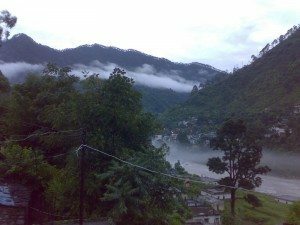 Nainital is nothing special minus the Naini lake (tal) it is named after. A truly fabulous natural lake of enormous size and depth, it adds grandeur to an otherwise average hill station. It’s really amazing that there are nine such lakes in a close radius on those mountains. Not all are this big, but each one of those has an aura of its own. We strolled through the market by the lakeside and passed the boathouse. The famous Naina Devi temple is situated very close to the boathouse. Vishal clicked a photo from outside the temple as photography is prohibited inside. We then crossed the market and took the walking track along the lake. The lake looked beautiful with all the lights reflecting on the water. The walk felt so very soothing and relaxing. A lake town slowly going in to the grip of darkness with the electric lights taking effect is almost heavenly to behold. We missed our wives badly in those moments. We discussed only one thing though as we walked. What the next day had in store for us. The weather looked good for the moment but that couldn’t be trusted. 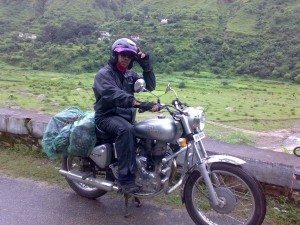 We had to take a huge decision whether to ride up to Karnaprayag as was the initial plan or to take the safer option of staying at nainital and visiting the other lakes in the vicinity. Back in the hotel, Vishal called up his Father-in Law who hails from Karnaprayag and has a house there. He told us that the road condition from ranikhet to Karnaprayag was pretty good and it won’t be much trouble if it didn’t rain a hell lot. He also told us the route to take and Vishal promptly marked the areas in the map. Thus assured, we ordered dinner and switched on the tv again. After dinner we had only two other things to do. To pray that the weather was good next morning and go to sleep. “The woods are lovely, dark, and deep………. So, we bid adieu to the valley of dreams and moved on. Ranikhet was just 30 kms from there and the road continued to be excellent. We rode past lovely flower gardens, picturesque hotels, and cottages. It was difficult concentrating on the road with such beauty around, but very little traffic on the road made riding fairly easy. We were gradually getting closer and closer to the clouds and soon we had clouds at our feet. It was simply amazing. The rain was light but there was very little visibility due to the clouds. Vishal’s bull’s headlight wasn’t working so he had to bank on the indicators to let others see him. I had no such problem though. Serpentine roads covered by dark clouds and two roaring bullets climbing up, it was a combination of awe, excitement, and sensation. A kind of feeling not everybody can relate to. Stories will be told and people will wonder what the atmosphere must have been. But the fact that we two can relive those moments anytime just by closing our eyes can’t be explained. It was a ride that promised to stay with us forever. It was only appropriate that the journey culminated in ranikhet. A beautiful hill station, small, clean, and sweet, ranikhet is a place where you feel like settling down. How we wanted to spend some time there, but our worries about the roads ahead forced us to move on. We rode through the Army cantonment area and took the road to Chaukhutiya. The road conditions deteriorated from that point but only just. We could still ride at a fair clip and rode non-stop to the cultural town of Dwarahat. A beautifully understated valley, Dwarahat seemed to pride on its cultural richness. I could see a college with a lovely campus, what better place for culture to breed. The weather was also pretty good with only little droplets of rain and the momentum was with us. The road had great variety in the forms of steep climbs, sharp descents, and narrow straights. We stopped at a PCO to call our families, as there was no network for our mobile phones. We felt hungry but there was no decent place to stop. From the scarcity of Dhabas on the way we could make out that it was a less frequented route we took. So much so that crossing the occasional vehicle was more of a relief than annoyance. But that was what we wanted, venturing into the unknown as much as possible without taking too many risks. We finally stopped for lunch at gairsain. Not that it was a town or something, it just had a deserted tea stall where veg chowmin was available. It was 4 PM on the watch and we still were 35 kms away from Adibadri. Karnaprayag was a further 20 kms away. The chowmin wasn’t good at all but it gave us the energy we badly needed. We set off again with the hope of reaching karnaprayag before dark. But there was trouble in store for us. 500 odd kms into our trip and the road finally tested us. Not sure if we could call it a road, it was narrow, muddy, slippery, and treacherous to put it mildly. Vishal and I were pictures of concentration, as we didn’t want a skid or worse, a punctured tire or something. The next 40 kms were covered in two and a half hours. It was dark by the time we reached Simli and we had a blind bull. Vishal is the captain of our team in his own right and always leads the way, but there he had no choice but to follow me in close quarters. Thankfully it was only 7 kms from Simli to karnaprayag and the road was good. Finally, we were in karnaprayag and that meant the end of an excellent day of riding. We had covered 225 kms through all kinds of roads. We deserved the rest that night. We had a place to stay in karnaprayag, as I said before. Vishal’s in-laws’ place had excellent arrangements. A lovely room to stay and great view from the balcony. The house, as I could see, was built on a small hill along the bank of a small mountain river. The river might have been small but it was full and roaring owing to the amount of rain that was falling. Vishal had been there before so I was the one really excited. I love villages as I myself hail from one. I often feel suffocated in an indifferent city like Delhi. The moment I saw karnaprayag, I decided that I’d revisit that place and spend some time there. That time I’d definitely go prepared to fish in that river. That’s a hobby I am not able to pursue too often. We got a warm welcome in that household. Tea and snacks arrived soon and so did a bunch of small kids. They definitely found our gears and us interesting. I did play with them a bit as well. Nice and relaxed, we climbed on the rooftop. It was dark by then and we could just hear the river flowing. The surroundings almost seemed indifferent to our presence. Not a soul could be heard at 8 in the evening, it was just so quiet. We stood there in the dark and discussed our plans for the next day. We were at a place 400 kms away and had to make it back to delhi by the next day. Sunday was my wife Nisha’s birthday and I wanted to be with her in person on that special day. It was more special because it was the first such occasion since Nisha and I met and got married and I had promised her my presence on that day. It meant that we had to ride for long hours on Saturday and it would be night before we reached Delhi. We had to start early. An early dinner was served and we hit the bed by eleven. We woke up at 5-30 sharp next morning. The beauty of that misty morning in that mountain village can’t be explained in words. The river was covered in mist all the way. And there was dark clouds hanging over the mountains. After a few nice photographs we packed our luggage and loaded the bikes. We left karnaprayag very early. And we thanked god that we did. The road condition was horrible for 12 kms or so and it took us almost an hour to pass that stretch. After that we breathed a sigh of relief as the road conditions improved. We stopped for breakfast and wondered what lay ahead of us in terms of road conditions. The mood was entirely different from what it was in the previous two days. That morning we were not comfortable with our target. Delhi from that place was still 388 kms adrift and the weather didn’t look promising. But that feeling of doubt and pessimism wasn’t likely to last with us for too long. We soon got down to what we did best – ride. The road condition up to Rudraprayag was average. 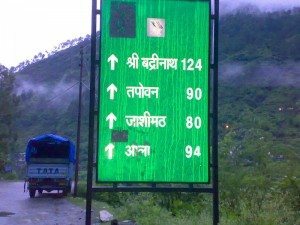 I had planned to stop at Rudraprayag to click some photos at the famous spot where the legendary Jim Corbett shot the “man-eating leopard of Rudrapryag”. But the rain god had other ideas. A steady drizzle gave way to a torrential downpour and it was just not possible to take the cameras out. We kept riding in the rain and it was very dampening to be honest. But the saving grace was the highway. If the road to ranikhet was a dream, that road beyond rudraprayag was an improvement on that. It was a pleasant surprise to see such a wide and flawless road so high on the mountains and for such a long stretch. That highway made sure we rode without much trouble despite the heavy rain. Our ride otherwise was very uneventful, no stops, no photos, and no striking natural beauty either. At around 12-30, we stopped for lunch at a decent dhaba a few kms from Devprayag. There was no point putting on dry clothes, as the rain wasn’t likely to stop. So, we just lunched on some steaming hot daal, rotis, and a very spicy bhindi ki sabzi. We were cold and the hot food tasted all the more better for that. We both ate our fill, as it was Rishikesh non-stop from there. The rain too took a break as we stopped but resumed the moment we started the bikes again. By then we had got used to playing hide-n-seek with the rain god, so we just smiled and rode on. Soon we reached Devprayag. The sangam of the two rivers Bhagirathi and Alaknanda looked so frighteningly beautiful that we had to stop to admire. We spent a few minutes there on top of a mountain overlooking the sangam and then moved on. The road condition was still good but the traffic got heavier the closer we got to Rishikesh. But we negotiated that pretty well. A bulldozer cleaning up the debris from a landslide delayed us for a while, otherwise, it was a smooth ride up to Rishikesh. In Rishikesh we got caught in a mighty traffic jam and took a while to come out of that. It was already 4 PM on a cloudy day and that meant not too many hours of daylight left. We had to get the headlight of Vishal’s bike fixed if we were to harbor any plan of making it to delhi that night. We enquired with many bike mechanics but none knew a thing about bullets. The only bullet shop we managed to find was closed. It seemed luck was not with us. We pulled up at a bus stop in order to rethink our plan and try to fix the headlight ourselves. In the process of a desperate hit and try, we discovered that the headlight bulb worked with the dipper switch. It was a definite lifeline and Vishal soon taped the dipper switch down to its burning state. It looked like working fine and we were smiling again. The bulls came back to life and we headed for Hardwar. But to our dismay, got caught in a terrible jam again just before Hardwar. That wasted a lot of our time and dampened our spirits no end. But we eventually made it through that jam and not only the road but also the sky cleared up. The sun came out and suddenly the task of making it to delhi didn’t seem all that difficult. We rode full throttle on the flat and straight highway. 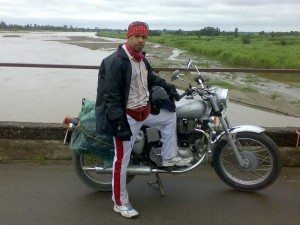 The plan was to cross Mujaffarnagar as early as possible. We stopped for tea at a dhaba 30 kms from Mujaffarnagar and put on dry clothes, as we were not chasing the rain any more. Wow! That was such a relief. We would’ve given anything to get out of those wet and dirty clothes I am telling you. The sweet evening sun, a light breeze, and pleasant dry clothes combined to make the ride enjoyable again. But it soon got dark and riding became pretty difficult. We were not prepared for night riding so we didn’t have night vision glasses or anything to protect our eyes. Also, keeping the helmet visor down wasn’t possible as it blurred the vision considerably. Riding behind buses and trucks became increasingly irritating with sands and dust flying everywhere. It was very difficult keeping the eyes open and to add to our woes there were too many potholes on the road. Both our bikes were on high beam and there were no streetlights. It was virtually impossible to see the potholes. The trouble was more for Vishal as he was leading the way and kept on bumping into potholes. I was better off with Vishal for guidance just ahead of me. I followed his riding line and avoided most of the potholes he failed to avoid. Still it was woeful enough for me and not to mention Vishal. All this trouble made sure that our speed was pretty slow and we reached Meerut after 9. It was not fun anymore and we regretted not spending the night in Hardwar. Actually, we failed to visualize the trouble ahead and in my desperation to reach delhi, I kind of forced Vishal. But what was done was done and we took it in to our stride as another type of experience that taught us a few things. We were on to the last phase of our ride and it felt good. The highway beyond Meerut was well lit and the potholes too vanished. Another two hours of careful riding and we reached Ghaziabad. I thought it appropriate to part our ways at the point where we met up three days back. That meant I had to take a longer route to get back home. But that was worth it. We reached badarpur border at 11-40. Another hug and we congratulated each other on a memorable and eventful ride. I had to rush, as there was just enough time for me to make it back home before 12 and be the first person to wish my wife on her birthday. It was dot 12 when I reached home and found Nisha standing on the balcony. I was still not off the bike but wished her from there only. I had made it, yippy. The real essence of life is in the fulfillment achieved through keeping promises. It was just a fitting end to a journey of a lifetime. Thank you for reading through, this is Anandarup Nandi signing off. Man..this was amazing. I couldn’t take my eyes off you article untill i finished reading. 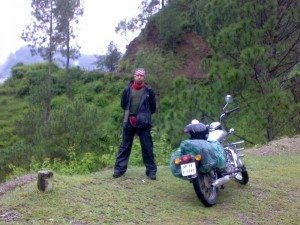 I have been on that route between Nainital and Ranikhet and could very well relate to your feelings. Well done guys. And congratulations on reaching home just in time. Quite engaging and nicely described. I know exactly what you been through my friend … I just had a short ride here in Atlanta, USA on my motorcycle … was around 50 miles of non highway road to a friends place with HEAVY rains and windy roads…. I also happened to witness lightning strike at about 60-70 mtrs away from me … was quite an experience. I’m soon moving to India … I’d like to know about the Thunderbird … any help would be appreciated …. Hi Harshal, nice to know about yr interest in Royal Enfields. The new Thunderbird twinspark in a state of the art machine that is very unlike RE. Over the years they have been averse to major updates on their machines. But of late things have changed for the better with the Machismo 500 and twinspark Tbird. The advanced digital twinspark technology gives the new Tbird more mileage and better performance. The new hydraulic tappets are a blessing as you don’t need to reset the tappet after every couple of months now. The overall design of the bike is still the same with the dual-tone color making way for single tones. I somehow prefered the dual-tone color though. With the ride comfort and road presence, Tbird is way ahead of competition. Only if you need more raw power you can opt for the Machismo 500. Thanks a lot for the information Matador! The photographs are really beautiful. The pics are very small, let me see if I can make them bigger. Nice work. Reminds me of the ride that we took decades ago. Unmatched thrill, I must say. I can imagine your joy riding through the beauty of nature in those mountains. Those mountain roads do create an aura of awe, and that can be felt by those who have actually gone through the experience. Yes, the memories can be recreated by just closing eyes. I have written a post recently on my trek to the Valley of Flowers about 10 months back expressing similar sentiments. Lovely post. Thank you for sharing your experience. Thanks Nitin. This is pure nostalgia. This ride we did 8 years back. Thanks to Nandan for republishing it. And, for you, the day you throw caution to the wind and set out will be your moment. Cheers! Once I started reading your this beautifully written story I found myself moving along with you all the way to see you wishing your wife. Dear brother, it�s been a while that you signed off and perhaps my this comment will hit your email inbox and you will sign in again with yet another master piece of your travel experience. Thanks Anupam for the nice words. Yes, it’s been a while since I rode last. Stay tuned, there may be something in the offing. Cheers! Thank you Anand for helping us re-publish this thriller. It still reads as fresh. Delhi is getting into summers and after re-publishing, I am thinking that we should have probably delayed it by a few weeks. On to many more such rides. Thanks to you Nandan for refreshing some great memories. Those were the days. 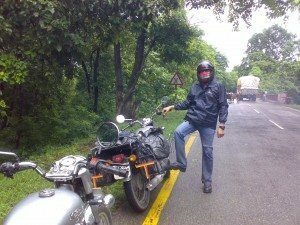 I didn’t have any protective gear and we rode through Uttarakhand in the heart of monsoon. Rides will continue to happen, but, the spirit and drive of the past will never return! Cheers mate! I will try the alternate route you mentioned for reaching Nainetaal the next time . The way you have explained the entire trip (and the urgency to reach home) was fantastic. Getting shivers out of excitement down the spine just reading and thinking of the ride you both had. I wish i will be able to write something like this one day. Thanks a lot Sumit for the appreciation. Wish you a few rides like this. Cheers! Great account of the motorcycle run through the hills – read it with the look of ‘I wish I could do it too’! Man….!! Amazing Amazing Writing..!! Everything in it! !